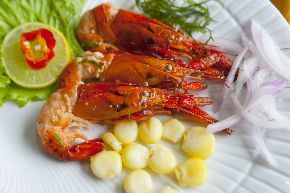 Arequipa is known for its delicious gastronomy where one of the main ingredients is shrimp. This crustacean is the star in all the gastronomic fairs held in this department when one of the cities celebrates its anniversary. This time is Camana’s turn, the city with the same name of the province, which this week celebrates its 470th Spanish foundation anniversary. For this reason, this Sunday 15 will take place the Shrimp Festival, in which traditional restaurants of the province will participate. These restaurants will exhibit the most varied dishes made out of shrimp. The festival will take place at the Camana River, where the fishermen men can capture the shrimp and cook them immediately. This event will offer some typical dishes such as anticucho, chicharrón, cebiche, chupe, picante, capisca, among others. Camaná is a coastal town in the Arequipa Region in southern Peru. It is the capital of Camaná Province and Camaná District.